Thankfully, not much went wrong at the Rio Olympics. Does that mean that the risks were not there? Hardly. Brazil worked very hard to clean up their river full of feces, and took extra precautions with the Zika virus. Risk can be mitigated when attention is brought to it, and I’m glad they focused on these potential issues. What Could Go Wrong at the Summer Olympics? This question should be changed to: What will go wrong, and what has already gone wrong? 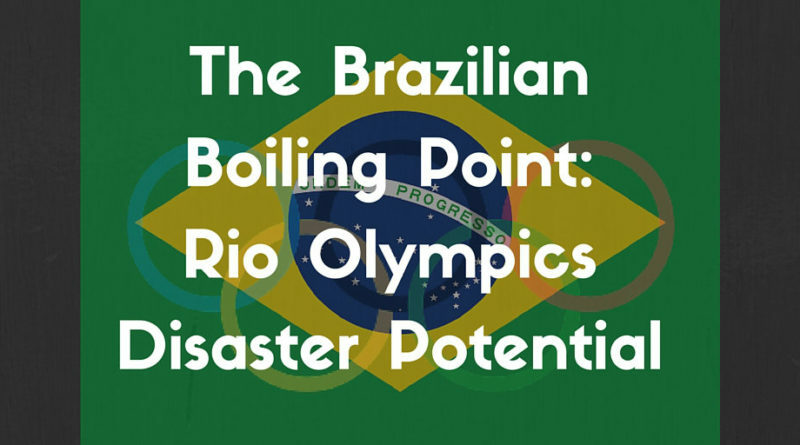 The missteps and unfortunate events preceding the upcoming Olympics have shaped this world event into a whirlpool of disaster potential. Here is our quick risk assessment to identify potential risks associated with the Rio Olympics in Brazil. The Zika outbreak is thought to have been perpetuated by the World Cup held in Brazil, from the influx of people around the world. The Olympics is the same situation, but magnitudes larger. The risk for accelerated global Zika spread is real, and Brazilian officials are trying to mitigate the mosquito threat, but how effective can they truly be? History has shown us that terrorists appreciate a world stage to commit their cowardly bombings and mass shootings. The Olympic Park bombing in 1996 reminds us of how real this threat is. Political statements, whether violent or not, are very likely when the entire world is watching the Olympics. Literally, a river contaminated with raw sewage and more is part of the Olympic games. While this is an isolated risk to the participants and people in Rio, the low priority for sanitation increases potential for sickness and civil unrest. It is a surely a bad sign when a river full of raw sewage and dead marine life is one of the lower risks in a risk assessment. President Dilma Rousseff has been exposed in a massive corruption scandal with a state run oil company. She is currently embroiled in impeachment talks, and protesters both for and against her have taken to the streets. Political unrest can be especially dangerous when under the world’s microscope, and the Olympics may just magnify the unrest to a dangerous level. The Olympic bombing twenty years ago were tied to politics related to abortion, so we know politics can motivate terrorists as well. Mitigating this risk is imperative for a successful Olympic games in Rio. Brazil is currently in the worst economic crisis since the 1930s. Whatever resources they spend on the risks identified above, is less resources for the country, which increases the risk of civil unrest due to economic stress. It is a Catch 22 situation where they will have to find the balancing point between the four risks above and economic stress. If the Brazilians spend too much on park security, mosquito control, and suppressing the political upheaval, they may find themselves past the brink of economic recovery for a very long time. The Olympics will be starting in less than 100 days, which provides an extremely short timeline to deal with the risks identified above. It is almost guaranteed one of these risks will affect the Olympic games, if not all of them. While the world comes together to celebrate sport, we may also get a lesson in preparedness.